Most people know why Columbus discovered America- he was looking for India and China. What most people don’t know, however, is why he was looking for them, and why exactly it was so important. Columbus thought that he could reach China because he thought the world’s circumference was considerably smaller than it was. Ptolemy, an ancient Greek polymath, was responsible for Columbus thinking the world was smaller. His erroneous calculations were considerably smaller than the accurate calculations of his fellow ancient Greek, Eratosthenes, who accurately calculated its circumference to within 15%, which is pretty impressive for his time. Europeans had an approximate idea how far away India was to the East, so Columbus simply subtracted that distance from Ptolemy’s estimate. 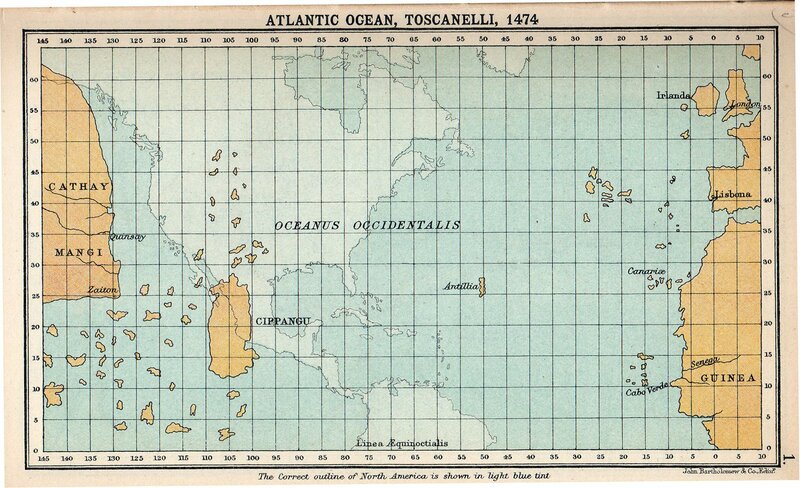 A map of what Columbus thought the world looked like overlaying a modern map. It should be made clear here that essentially everyone in Europe knew that the world was round- it had been common knowledge since the Ancient Greeks. The whole thing about medieval and Renaissance era people thinking the Earth was flat? Made up by some partisan historians trying to discredit the Catholic Church. That’s a whole different story, though. Why was Columbus so interested in getting to India and China, though? Well, basically put: Europe was a backwater on the stage of global politics at the time, and the Muslim states were blocking them from getting access to important spices and other luxury goods from India and China, the two wealthiest and most powerful nations on Earth at the time. (Well, China was an empire, but India was a bit more… complicated politically.) Portugal was funding extensive exploratory missions at the time to try and find their way around Africa to get to India, as well as to find the legendary king Prester John. Portugal would succeed at rounding Africa and reaching India less than a decade after Columbus discovered the Americas. The spice trade was HUGE business in Europe. The fortunes of Venice, the wealthiest city in Europe from the beginning of the Crusades well into the 1500s, were almost entirely built upon it- and, to be clear, those insane profits were just off the relatively constricted flow of spices coming through the Middle East. Black pepper from India made up the bulk of the trade, though frankincense from the Middle East, nutmeg from Indonesia, and many other spices, like cinnamon, were included. 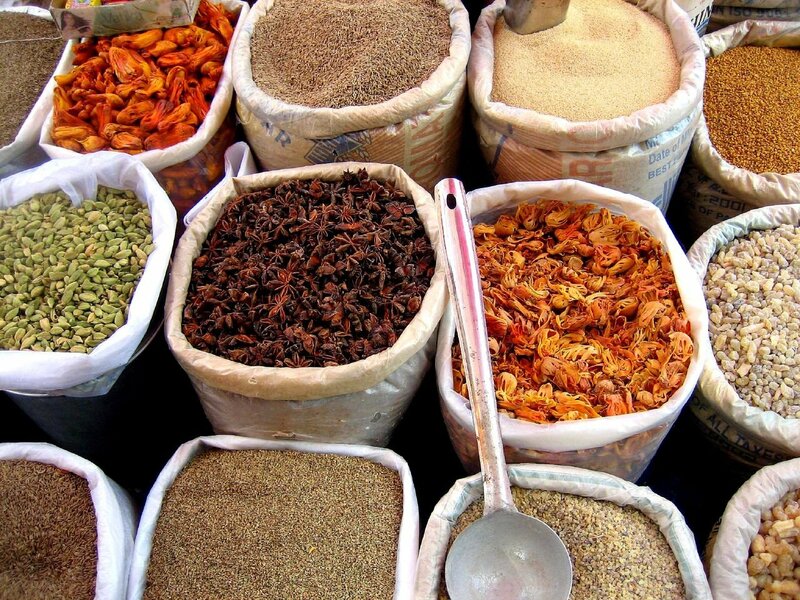 It wasn’t a new trade, either- a considerable portion of the total GDP of the Roman Empire went to the spice trade. So much of Rome’s gold went to it, in fact, that if they had stopped conquering new territories for revenue, the spice trade could have single handedly driven them bankrupt. Huge hordes of Roman coins have been found all over India, and spices and goods from China have been found in Roman archaeological sites and records. (The Roman Empire is the only time before the Age of Sail where Europe wasn’t a worthless backwater, and even then it was dwarfed by Imperial China.) Going back even farther, we’ve found archaeological evidence for Sumeria in ancient Mesopotamia having had a fairly extensive spice trade with Harappa, their enigmatic and powerful contemporaries in India. Once Columbus and his successors started exploiting the Americas- and boy, did they exploit them to the point of genocide- they began to send back all that gold, silver, and other valuables straight to Europe. Europe, however, kept descending deeper into a bullion shortage. Why? Well, literally all of the gold and silver sent to Europe got sent straight on through the spice routes, both the old ones through the Middle East and the new ones around Africa. Europe had literally nothing else that interested India and China. The great powers of the Indian Ocean barely paid any attention to Europe’s existence, except as mildly amusing barbarians half a world away. If they had, history would have turned out extrordinarily different. If China had become aware of Europe’s ambitions, the treasure fleets led by Zheng He could have certainly reached Europe. Unfortunately for China, that never happened, and the treasure fleets were disbanded, never having traveled farther than East Africa. (Despite the claims of the moronic pseudohistorian Gavin Menzies, who claims they reached Europe.) And, again showing the difference in power between them, the average ship in the enormous treasure fleets was around 10-20 times larger than the caravels used by Portugal. A woodcut illustration of junks from Zheng He’s treasure fleets. All of this has important lessons for today- namely, on the topic of globalization. It is by no means a new phenomenon. Global trade and communication of ideas has been happening since the dawn of writing, if not earlier. The global trade routes dominated the economies of countries halfway around the world from each other. History is often taught as though Europeans connected the world together in the Age of Sail, introducing all these cultures together. This, frankly, is absurd. Europe was the only major center of civilization outside the Americas to be so isolated, and that was largely their own doing. We can draw a lot of understanding about how today’s globalization will affect nations, both the powerful and the weak, by looking at how the spice trade affected the world for its millennia of existence. Much of the world’s economy hinged on it. Its profits helped the rise of the Muslim Caliphate, filled the massive treasure chambers of India, and eventually led to Europe’s global dominance. Often the study of how different parts of the world interacted is far more important than the study of those specific parts of the world. For further reading on the topic, I highly recommend John Keay’s excellent book The Spice Route: A History. David Graeber’s Debt: The First 5000 Years covers some of the economic aspects (among others), and Gary Paul Nabhan’s Cumin, Camels, and Caravans goes in depth into the land aspect of the trade, as well as offering recipes from the times and places involved. Posted in History and tagged Age of Sail, china, Columbus, exploration, History, pepper, Ptolemy, round earth, spice, spice trade on September 3, 2017 by mountainwashere. Disposable chopsticks are an environmental disaster. Known as Waribashi in Japan, where they were invented in the mid-eighteenth century; the overwhelming majority are produced in China, which is also their biggest consumer. 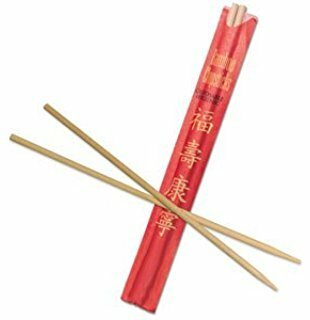 China manufactures over 57 billion pairs of disposable chopsticks every year. An American company, Georgia Chopsticks, has gotten in on the business as well, producing billions more pairs each year. Others are manufacturing them as well- there is an unending demand. All of this adds up quickly. Even producing thousands of chopsticks per tree, it equals over 25 million trees felled per year. That’s over 10,800 square miles a year. An understanding of why they’re so used so heavily is essential in trying to find a solution to the problem. Somehow, a not insignificant portion of the conversation has decided that the disposable chopstick is a symptom of Western consumer culture. The truth is actually quite different: The disposable chopstick grew from chopstick-using cultures’ ideas of hygiene and etiquette. To explain why, we have to understand the history of the disposable chopstick. Posted in Food, History, Uncategorized and tagged Bee Wilson, china, chopsticks, Food, History, japan on August 31, 2017 by mountainwashere. I think Campbell is a little optimistic here- there are definitely plenty of historians who fail this test. (Nationalist historians, most often.) Nonetheless, when dealing with not just history, but with any social science, it is important to weigh any claims against this standard. There are, simply speaking, so few times when we can trace the causes of an event or situation back to a single origin. It’s always far more complex than that. The Great Transition is an in depth analysis of the later Medieval period centered on the 1300s- that period of massive change that included the Great Famine, the Black Death, the collapse of the Mongolian Empire and its associated land trade routes, the collapse of the European Truce of God that had been reducing warfare in Europe, the end of the Medieval Climate Anomaly (centuries of pleasant, kindly climate) and the beginning of the Wolf Solar minimum and the Little Ice Age, etc, etc. Basically, this time period was one of the most eventful, and important, in human history. Posted in Book Recommendations, Book Reviews, History, Science and tagged books, Bruce Campbell, bubonic plague, environmental history, History, Jared Diamond, Medieval on August 4, 2017 by mountainwashere.